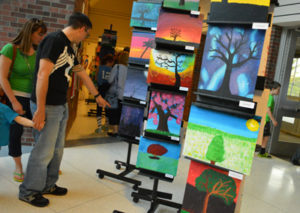 The arts enable students to explore, expand and enrich their view of life. Students begin to see these connections when they express their own ideas and incorporate skills in their work. Our comprehensive art education program enables students to understand individual, social, cultural and environmental dimensions of humanity. The elementary art program is an introduction to the sequential program outlined in the EGCSD Art Curriculum. Elementary students are exposed to a variety of media (paints, markers, colored pencils, paper, clay, etc. ), art production, art history, art from different cultures, art criticism, aesthetics, and assessment. 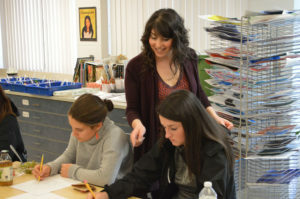 During art class, students look at, discuss, and write about various artworks and styles, including their own artwork. 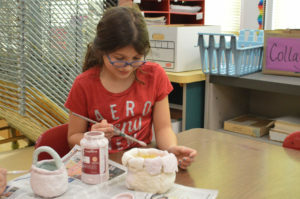 Students explore a wide variety of media and technique and create both two and three dimensional works of art. Identifying and utilizing the elements and principals of art (i.e., color, line, shape, texture, unity, etc.) is embedded within each lesson. Individuality and creative problem solving are stressed rather than the production of objects that have a predetermined final appearance. This enables all children to feel successful and promotes an increase in focus and an appreciation for expressive art forms. Artworks are routinely displayed within the school buildings. All elementary students are scheduled for one 40-minute art class per week taught by certified art instructors. In sixth grade, our students explore a variety of media and technique with an emphasis on skill-building. In seventh grade, art students continue to explore media and begin to hone observational drawing skills. In eighth grade, project work becomes lengthier, encouraging students to remain focused on a multi-faceted art project for a longer duration of time to prepare for the realities of high school and beyond. All art students at Goff Middle School are offered a safe place to explore creative problem solving skills and the framework to continue an examination of one’s own identity. All middle school students attend a 43-minute art class daily during a ten week session taught by certified art instructors. Students must enroll in a course that meets the full-year art requirement for graduation. Studio Art is a comprehensive foundation course for all secondary school art. Students are introduced to a variety of studio experiences pertaining to the study of art including drawing, painting, sculpture, and ceramics. The elements and principles of design are incorporated into the studio experience so that students learn to evaluate art (their own and other artists), as well as create and design art that is self-directed. Students meet every day for a 45-minute class period taught by certified art instructors. The frequency of meeting time allows for lengthy projects (sometimes spanning weeks) and ample time for experimentation with materials before beginning long-term assignments. At this level, students further develop their observational drawing skills and are encouraged to create their own, unique responses to class assignments. Students learn that there are multiple solutions to artistic problems. These electives provide students with the skills needed for postgraduate experiences (college and careers). In addition, Advanced Studio in Art students produce a portfolio of work for college entry preparation that showcases each students’ skillset, personal voice and style.